Ball Hank n' Skein: Icelandic Yarn! 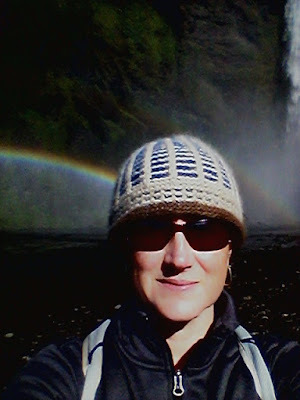 My friend Julie just returned from exploring Iceland on foot. She's adventurous, outdoorsy and athletic so when she decides to take a summer vacay she goes to Iceland and hikes through glaciers, snow and forest. Amazing! Here's a pic of her on her Iceland trip with a hat she knitted for herself. I call it her R2-D2 hat (right?). She's a beautiful person inside and out. Julie brought me back some Icelandic yarn called Kambgarn in brown and green. Perfect fall colors! It is squishy and soft and beautiful! I think it is the most exotic yarn I've ever worked with. 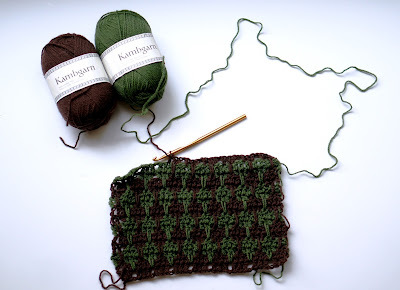 I decided to try out a new to me stitch called Lark's Foot using this tutorial by the Crochet Geek and it is super fun! I think I'm going to make a scarf or a cowl with it. I love how quickly it works up and I'm already getting some great ideas of how I can incorporate this stitch into some new patterns. What is the most exotic yarn you have ever worked with?